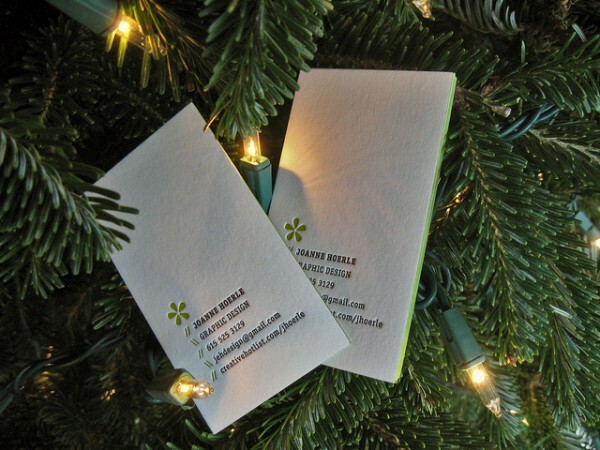 Joanne Hoerle’s business cards use black and light green inks printed onto 220# lettra stock, the business cards are finished with edge coloring. I bought A4 grey cards from Fancy Paper, cut them to size by hand and edge painted them with neon red paint. Each card is hand-stamped with custom rubber stamps on both the front and back. 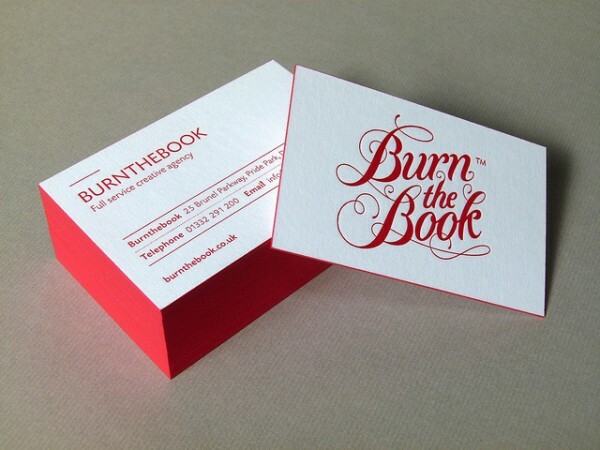 Letterpress business cards for design agency Burnthebook, printed onto Colorplan 700gsm Pristine White card stock with matching edge painting. 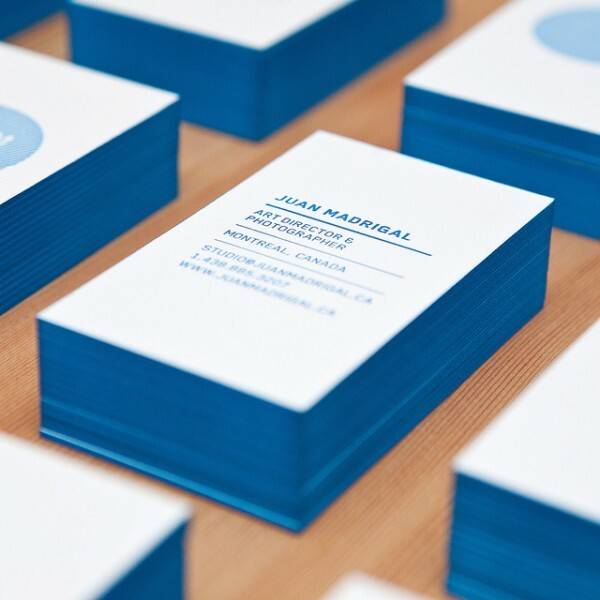 Juan Madrigal business cards were letterpress printed onto 4 ply 100% cotton rag mounting board. 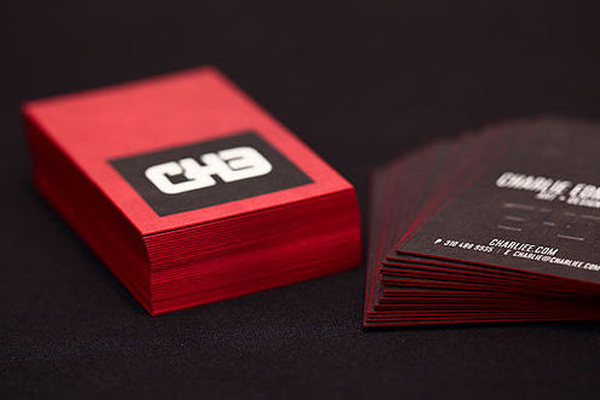 The business cards use soy ink – made from soya beans rather then traditional petroleum based inks. Using soy inks on the business cards makes it a lot easier to recycle. The cards were finished with edge painting, by hand using the soy inks. 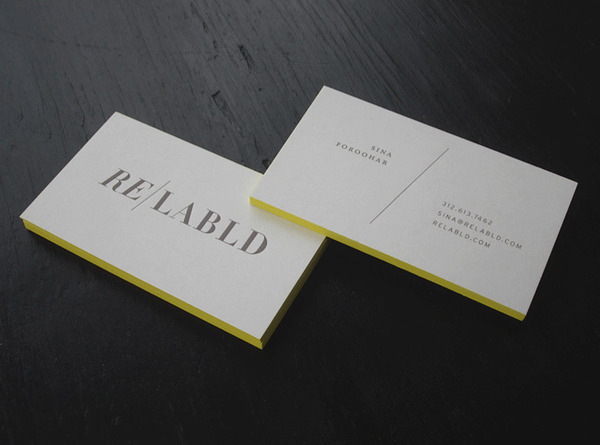 Relabld business cards have the logo and informational text letterpressed into the card, duplexing of paper stock to 260# and edge painting to give a yellow finish. 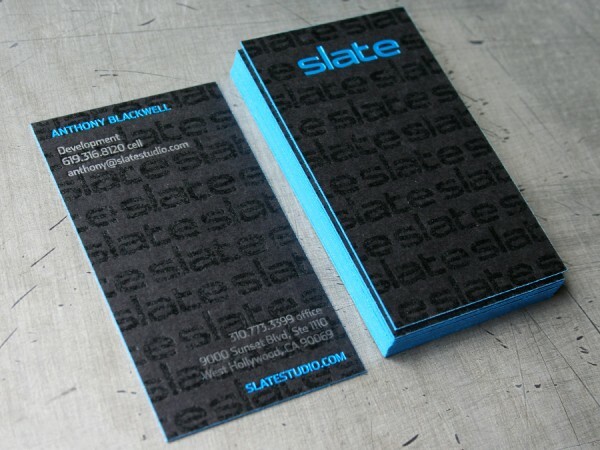 The Slate business cards are printed onto thick 200lb Cover Wausau Eclipse Black. We letterpress printed them with clear varnish on both sides, then a silver ink for the info text. Then they were foil stamped in a bright blue on each side. Finally, they were trimmed to size and edge colored in a matching bright blue. 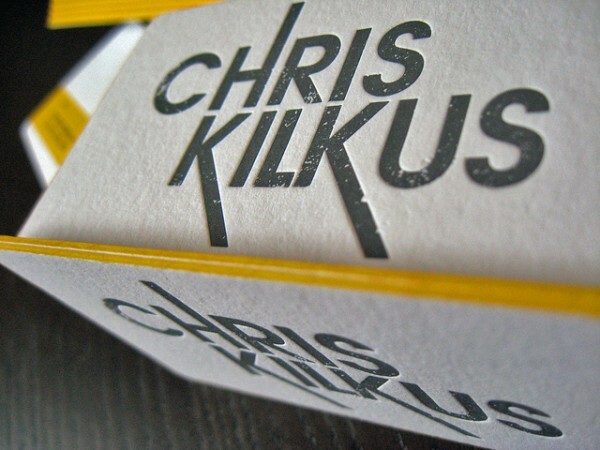 Chris Kilkus’s business cards were printed with raw 110lb crane’s lettra in fluorescent white. 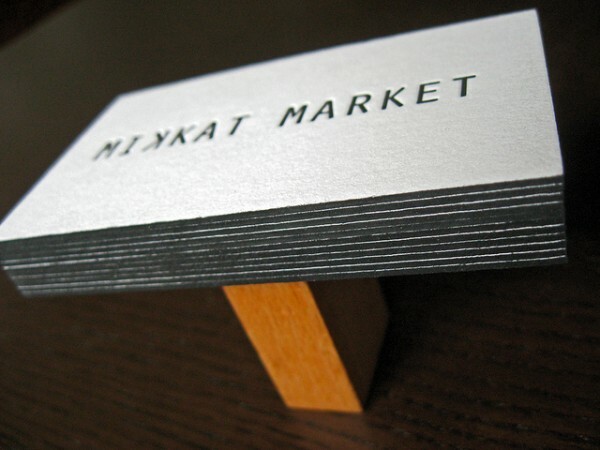 Each side of the business card was printed onto side on 110lb weight stock and then the two sides were duplexed together. 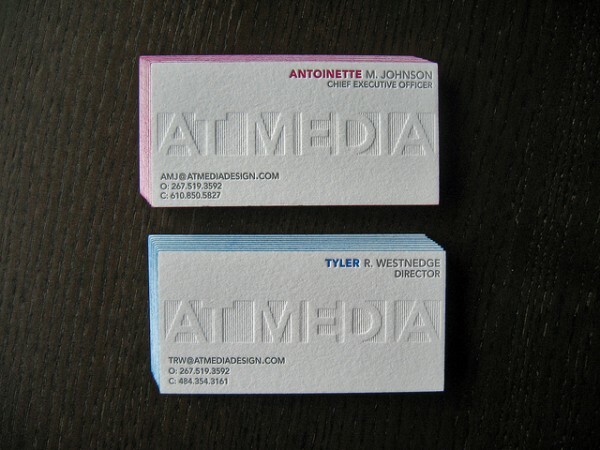 At Media’s letterpress business cards were created by printing each side on a separate sheet of 110# fluorescent white Lettra. After printing, the business cards were duplexed to create the final 220lb stock. 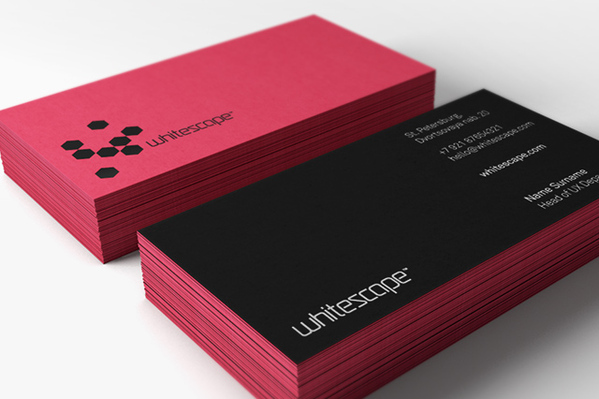 This business card was created as part of the corporate identity for Whitescape, Whitescape are a team of professionals focused on large-scale cloud computing web projects. 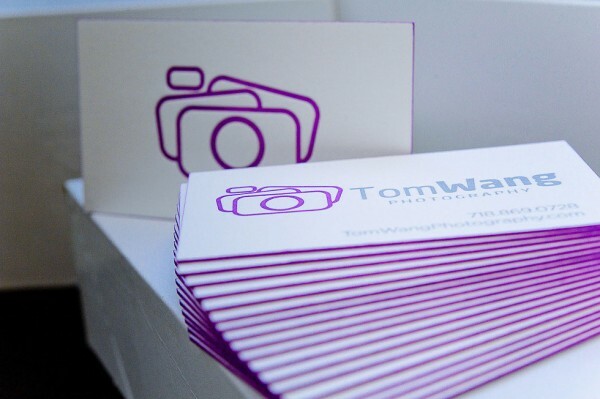 Tom Wang’s business cards were printed on 110lb lettra in flourescent white. The text was done in metallic silver ink and the camera logo in a custom purple. After printing we duplexed the cards to create a 220lb stock. The cards were cut to 3.5″ x 2″ and edge colored using the same custom purple color. 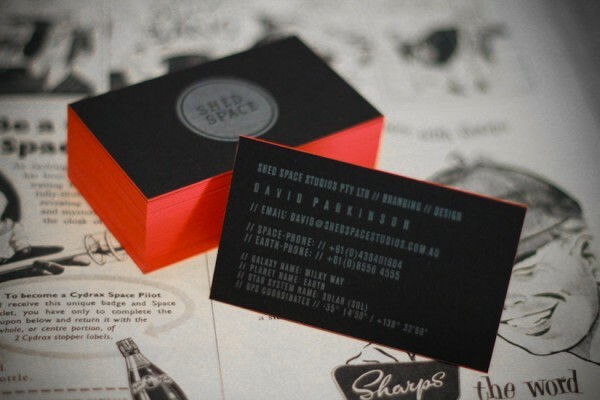 The Shed Space Business Cards are metallic silver letterpressed on duplexed 200lb Wausau Eclipse Black with pantone red borders. Printed by Studio on Fire. We wanted to have fun with our own branding and create something memorable. 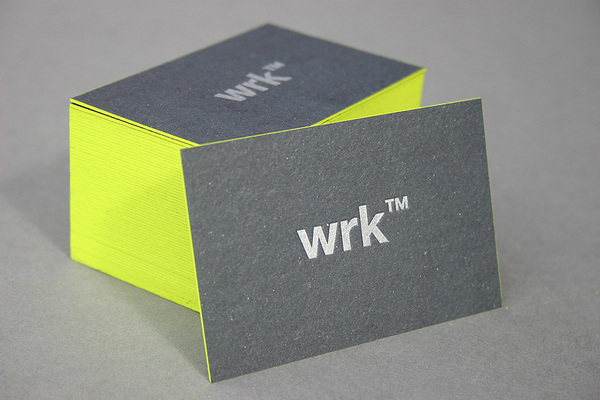 The WRK business cards were created byMark Lindop, a brand identity designer from WRK™ , the business cards use letterpress and edge painting to full effect. 24pt with custom embossing and full color process printing. Die cut and finished with red edge painting. 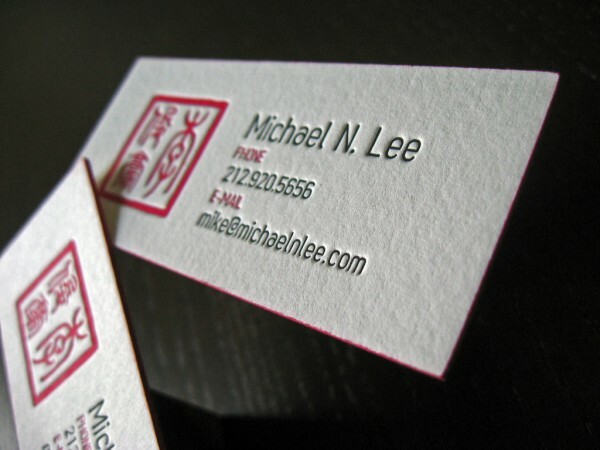 Michael N. Lee had his business cards printed with by The Dolce Press, the cards were printed in two colors: red and black using 1/4″ magnesium plates. 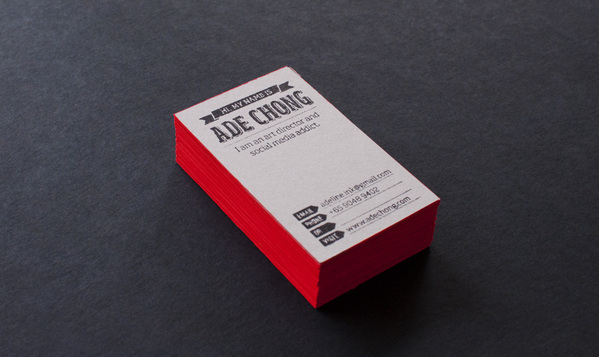 The business cards were printed onto 220# Crane’s Lettra stock and finished with edge coloring to match the red ink. 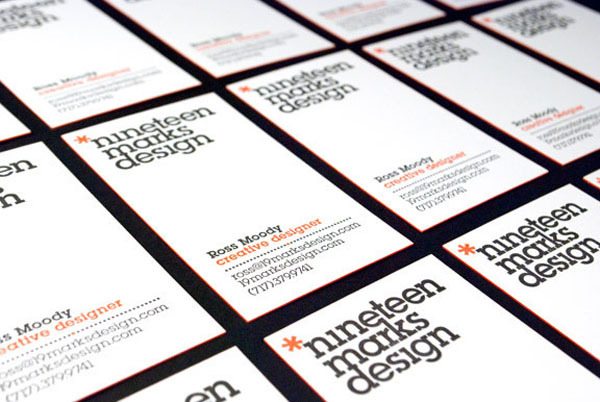 The spot UV 19 Marks Design business card is printed onto Neenah Neutech #160 with 2 spot colors, the business card also has edge coloring. 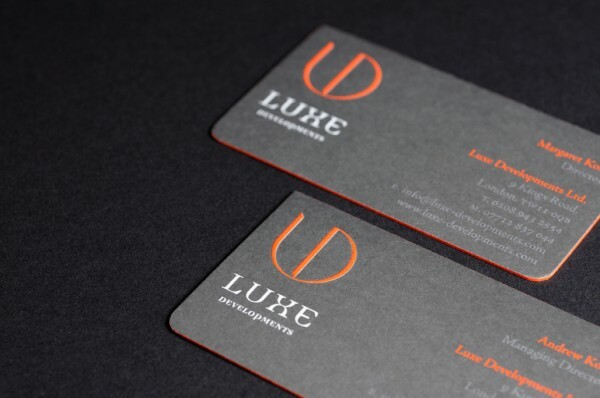 Luxe Developments business cards were printed on duplexed substrates to reach 700 gsm and a orange solid ink fore-edge printing process was used to print on the cut, outside edges of the business cards. 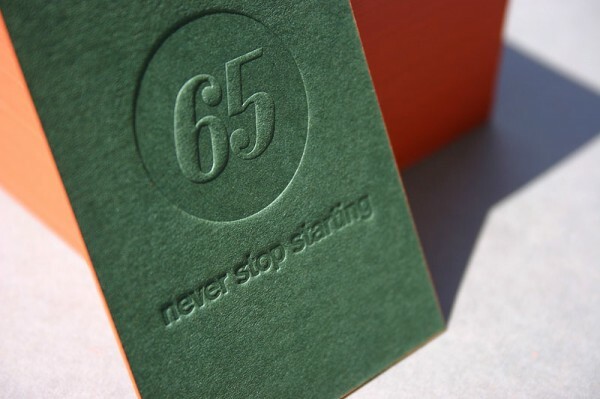 The 65 business cards were edge painted in orange onto 540gsm stock which was duplexed white to green. The front and back of the card are printed separately on 110lb stock and duplexed after printing, giving the heaviest impression possible. The cards were finished with black edge coloring. 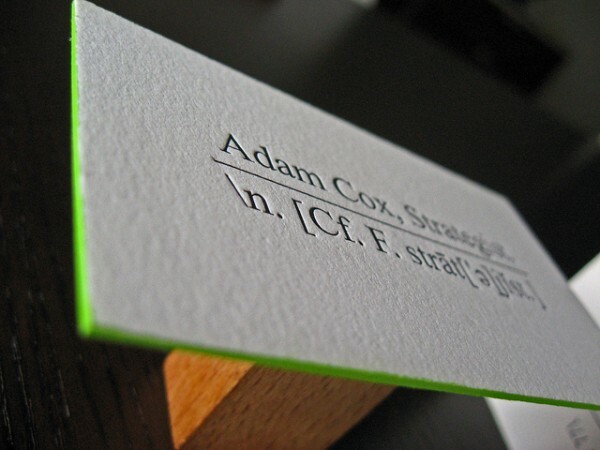 Adam Cox had his business cards printed by Dolce Press, the cards were letterpress printed on Crane’s Lettra in a pearl white color. The stock was pre-duplexed 220lb stock since the design on either side was just text and the card was finished off with edge color in a bright green. Mr Dipaolo has his business cards printed with letterpress metallic gold for the information and letterpress varnish on the logotype. 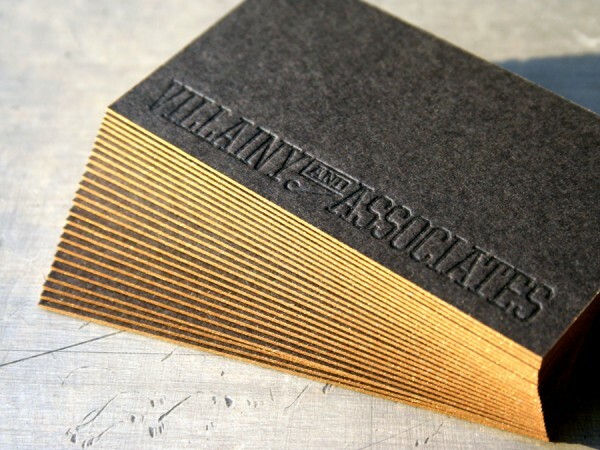 The card stock is a thick 200lb Wausau Eclipse Black with metallic gold edge coloring. I’m trying to find a vendor who will print these type of business cards for a client. Do you know of any printers that will or can do this? I wonder how much these cost. Can someone give me an approximate?